I have to admit that when I first heard about Gangstagrass, I thought that it sounded like a horrible idea. I couldn’t wrap my head around a bluegrass band combined with hip hop MCs. That was until I went to the basement of one my favorite Texas BBQ restaurants in NYC Hill Country. The basement which can fit 300 people was packed to the gills. I couldn’t believe what I was seeing on stage; it was a beautiful slice of America. 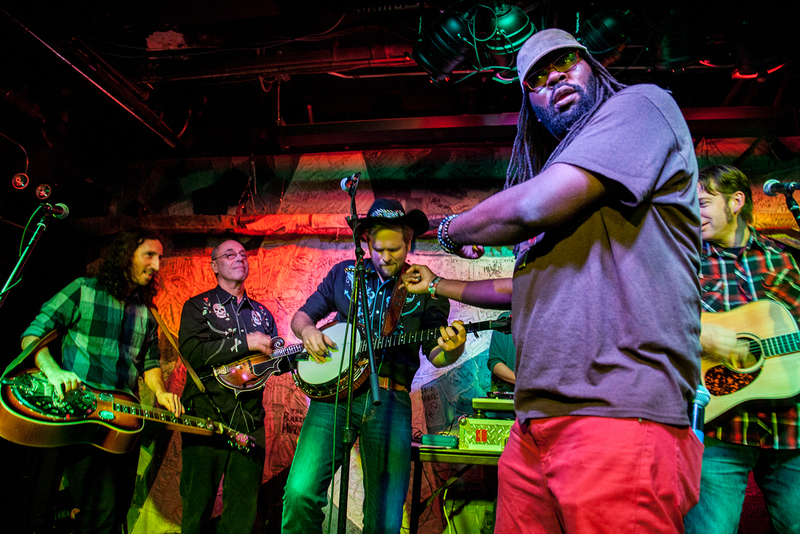 A classic redneck-looking white guy sporting a short boxed beard, a country western shirt, cowboy boots, and a ten-gallon hat played a banjo while an African-American guy with dreadlocks wrapped with his arms around the banjo players shoulders. There was an older grey haired man playing I am not sure what the instrument is called but it was twangy guitar thing he was getting down next to a pretty mulatto female DJ scratch mixing to the live show. The place had everything; people of all ethnicities, ages, and genders came together to perform that night, and, like my friend promised, made banjos cool. We sat down with Oscar Owens, known by his stage name Rench, and he told us about his brainchild, Gangstagrass. In 2006, when I was listening to a lot of classic bluegrass albums, a lot of stuff recorded in the 1970s had absolutely no drums in it, but the acoustic instruments are rhythmically tight. I could hear how well that would fit with a beat and with rappers on top. It was an idea that was sticking in my head and eventually I gave in and said, I just have to try this out. And when I began, I decided that it was going to be called Gangstagrass. So Blue Grass and Gangsta Rap. I just knew immediately that this is what it was going to be called. Your stage presence was awesome because you had so many moving parts. You had a banjo, a dobro (a guitar that is played laying flat); how many people are in your band? Depending on the show, people’s availability, and budget we play shows as a four-piece. Tonight, we had nine people on stage. 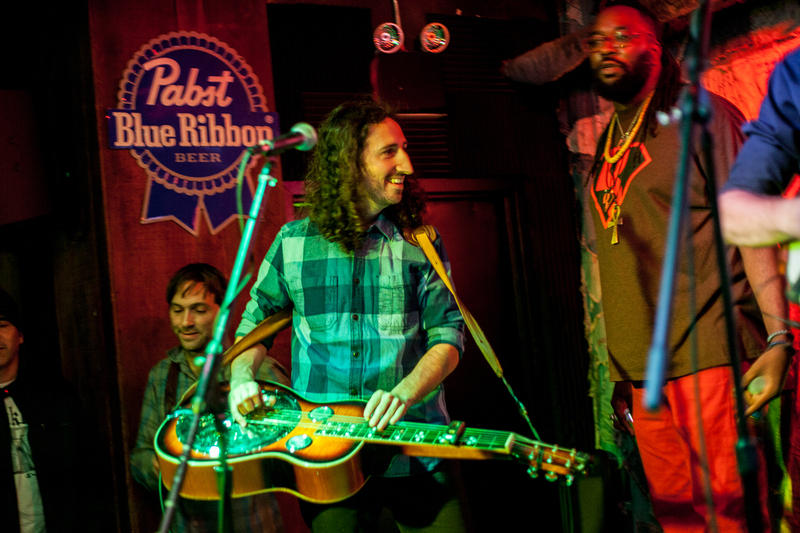 Here in New York City, we have a lot of friends, so we have someone that will say 'hey let me jump on stage and play mandolin', and we’re like 'yeah c’mon'. How did you find the rappers, and how did you convince them that this would be a good idea? In the early 2000s, I was working as an engineer in recording studios around New York and people would rent the studio and I would help make their albums and I got to know a lot of local rappers that way. I also started to make beats for people. I set up my home studio and was doing production for rappers. So when I decided to do Gangstagrass, my initial proof of concept was just sampling the old bluegrass records that I was listening to and used the vocals from the rappers that I had already recorded. And I was like, 'hey can I put your vocals over some bluegrass? ', and they were like, 'Sure Rench.' They didn’t know what bluegrass was. But I just put it up and I got a great response. It was blogged about and people downloaded it. I was already doing country hip hop with my own solo stuff, with me singing honky tonk songs and playing beats and scratching on it. But Gangstagrass is the project that really resonated and really took off. What was one of the most interesting reactions you got from when you launched this project? There have to be a lot of rappers who have never heard of bluegrass; I mean good bluegrass. Yeah, that's the terrible thing. Sometimes, people come to me and say, 'Hey did you hear that country hip hop song? ', and it's a cheesy banjo and it's very cliched and they think about the scene from Deliverance and they are not familiar with the really twangy bluegrass that is very soulful. So when I first got permission from the rappers, they were like, 'yeah do whatever you want with it.' When they heard what I did, they were pleasantly surprised. What is the difference between country and bluegrass music? Within the larger umbrella of country music are different sub-genres. So, for example, honky-tonk is kind of a swingy thing, kinda dancing but might also be sad songs, it's an electric music that will have electric guitars and steel pedal guitars and slow swing stuff. Bluegrass is very acoustically based. The instruments are a mandolin, fiddle banjo, dobro guitar, acoustic guitar and traditionally doesn’t have drums. It was invented as something that people just gather and stand around a campfire or something. Where is bluegrass music from? It is originally considered to be from Kentucky. There actually is a strain of grass that grows in Kentucky called bluegrass and Kentucky is known as the bluegrass state. Bill Monroe is considered the inventor of bluegrass music in the 1930-1940’s and he took some already existing things some Appalachian folk tradition and some bluesy stuff and some gospel stuff and came up with a particular formula with just these instruments mandolin, fiddle banjo, and then an upright acoustic bass and we are just going to do the rhythm ourselves without a drummer and do lots of harmonies and vocals. He set the formula for that. You have purists that say if there are drums in it's not bluegrass. But like anything, it evolves. How did you move to a live show? Once the downloads of the studio album started taking off I thought, 'this is resonating with people we should put a band together and do this'. I had a lot of connections with musicians, so I contacted people I knew and got word of mouth from other people who said they would be into it. And I assembled a band of people that did the initial recording. But some got busy with other projects, and for others, it didn’t fit with what they were doing, so it's been a process over the last five to six years to get the lineup of people who really want to get excited and take this project mixing hip-hop and bluegrass and exploring that idea. But now we have a core group that’s been coming out with us on tours for a few years. A regular banjo player, Dan Whitener; a couple MC’s that always come out with us, R-Son and Dolio; and now a fiddle player, Bryan Farrow. We have a nucleus of a regular crew that do the tours. What are some of your top songs? We were doing Darling Corley and we do that at the end of the show and it's just a one chord sort of groove and when we called her up on stage and she just started singing No Diggity. And that was the first time we ever did it and it was spontaneous we didn’t plan it. We got a lot of exposure by having the theme song from the FX series Justified and a lot of people find out about us from having that theme song. It got nominated for an Emmy for best theme song in a TV series and it played for six seasons and we definitely got a lot of fans so we make sure we play that song. So what are some new songs that you are working on, are you going to be playing any tonight? We’re going to be releasing a live album in early 2019 and we are just finishing the production on that. We recorded a lot of our shows in the beginning of 2018 and we are going through all the takes from all the different shows and venues and doing a best of live album. 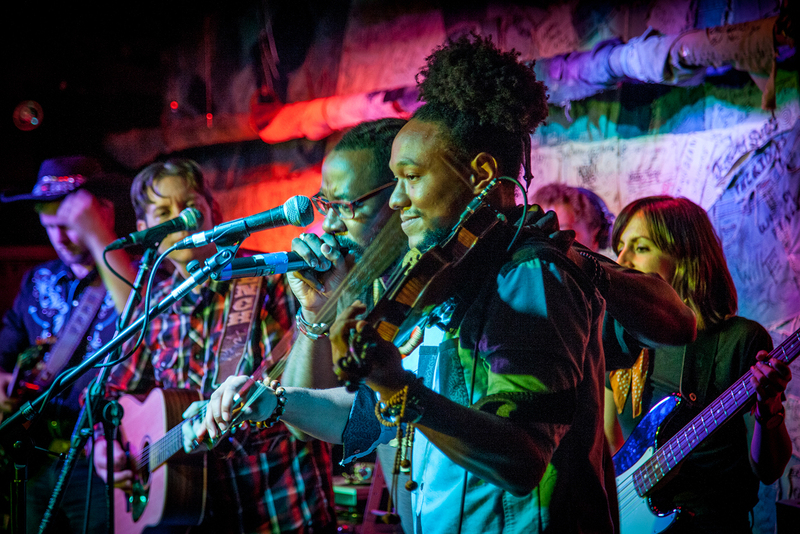 Bluegrass and hip hop seem like polar opposites, what can you say about that? 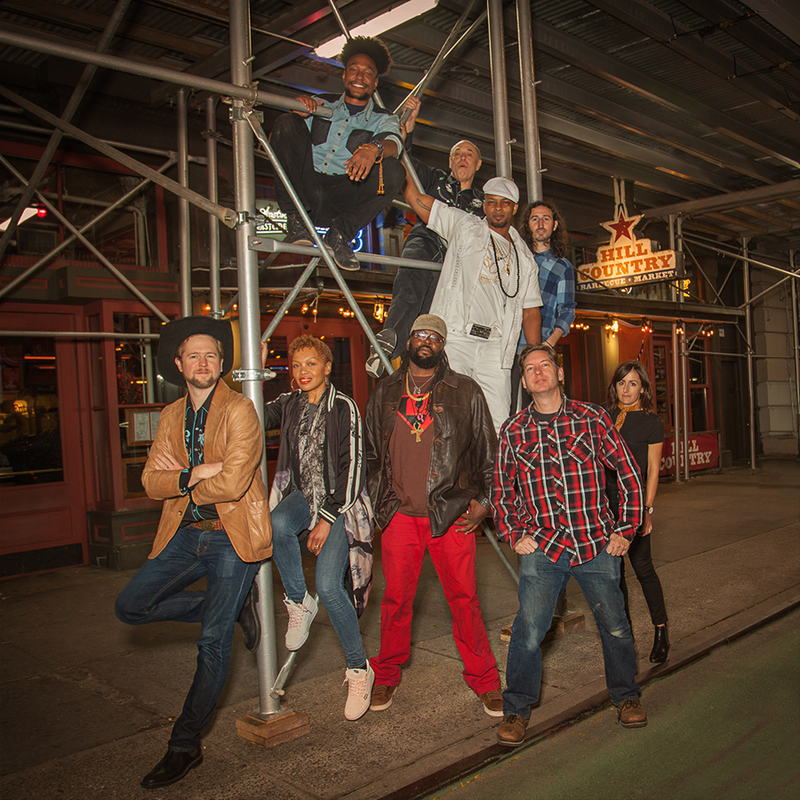 There are actually a lot of commonalities that we discovered be bringing musicians together from hip-hop and bluegrass. One being the subject matter of the songs. The outlaw narratives, poverty, struggles, the violent narratives, and storytelling. Both genres have so much overlap. They are, at the heart of it, essentially both types of folk music. They were created by communities where people wanted to have music to interact out in public and come and create together. In hip hop, it was people in the south Bronx who started having parties on the street and creating a new music. For bluegrass, it was people in the Appalachian mountains getting together on their porches and making music. We just had different vocabularies but for the same thing. So one example of that was in bluegrass the people might be strangers sitting around starting a song based on a chord progression they all know and then you can spontaneously take it from there and trade solos on the fly (that's called a "pick"), and in hip hop you can have guys standing around and somebody starts a beat box and then you can freestyle and then pass the verse to the next person, and that's called a "cipher". When we were playing and developing music for gangstagrass, when we said a pick and a cipher that's the same thing and it totally clicked. It was like, 'wait, I know how to do this and you know how to do this and now we know how to do it together'. A rapper totally knows how to freestyle and then throw the verse to someone and they could be throwing it to the banjo and the banjo knows how to get it and take a solo and kick it over to somebody else and that kind of spontaneity is really key in both genres so we try to take full advantage of that. Do you see any imitators in the future? I hope there are some imitators because we are kind of lonely out here. I think it would be wonderful to have some more bluegrass hip hop going on out there as long as it's being done well. A lot of times, when I hear about someone rapping over a country song, it's really a novelty act or its not really quality on either side or its just one song. The important thing for me about the formula is that it's real bluegrass players and real hip hop MC’s and bringing the two together that's the foundation. I’ve seen bands doing one song here one song there, but I would really like to see bands taking it on as a style. What would you call the genre? Besides Gangstagrass? You never get to decide on what label the things you invent and come up with. One way I think about it when it comes to genre names is that there is rock n roll or hip hop; there are these little pair of things. For me, the reference would be Bang and Twang. The hard sounds of the hip-hop sounds of the hard beats is the BANG and the TWANG is the way country instruments get the bluesy twanging sounds. 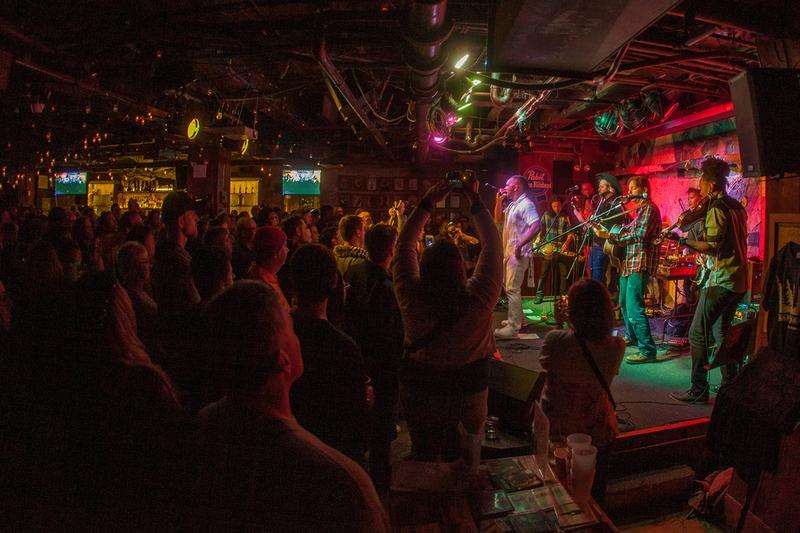 Catch Gangstagrass at their upcoming shows.